Heat olive oil into a 10-inch oven-proof frying pan over medium high heat. Add onions and salt and cook, stirring occasionally, until onions are softened, about 3 minutes. Add asparagus, reduce heat to medium-low, and cook, covered, until the asparagus are barely tender, 6 to 8 minutes. Pour in eggs and cook until almost set, but still runny on top, about 2 minutes. While cooking, pre-heat oven broiler. Put in oven to broil until browned, about 3 to 4 minutes. 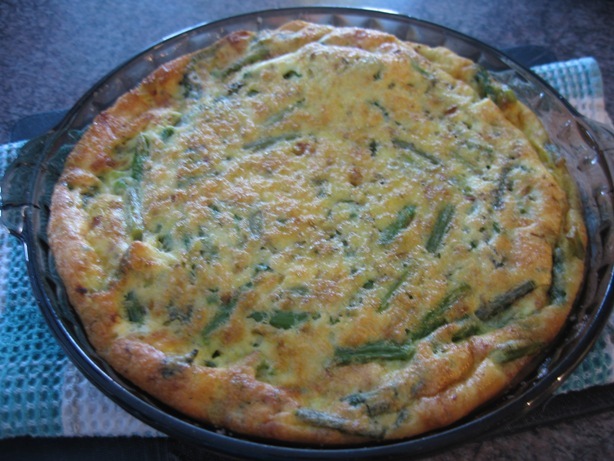 Remove from oven and slide frittata onto a serving plate.